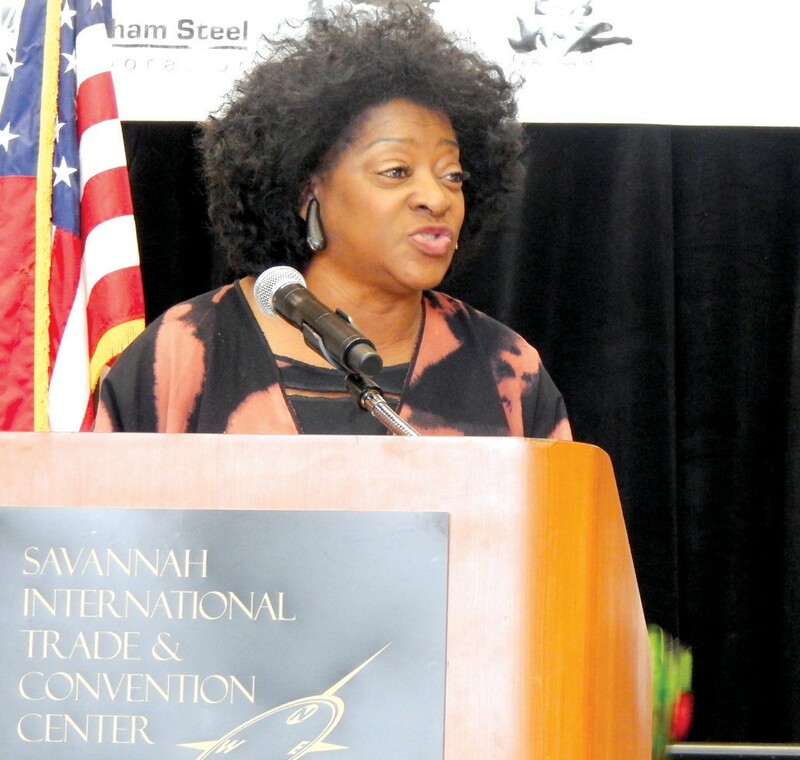 “I’m so glad trouble don’t last always” was the song that Dr. Tonea Stewart sang as she began her speech at the Business and Community Unity Brunch held on last Saturday at Savannah International Trade Center. The brunch was a part of the 35th Annual Martin Luther King, Jr. Observance Day Association, Inc. celebration. Dr. Tonea Stewart, a native of Greenwood, Mississippi has lived in Montgomery, Alabama since 1990. She is a professional actress, play director, national museum exhibit director, tenured Professor and the Dean of the College of Visual & Performing Arts. As an actress, Dr. Tonea Stewart is best known for her recurring role of Miss Etta Kibbee in In the Heat of the Night. She earned an NAACP Image Award nomination for her role in the film A Time to Kill. As keynote speaker, Dr. Stewart reminded us that as African Americans, we have a sad story to hear about our enslaved ancestors. She said “It’s time for us to tell our young men to pull up their britches and young women to stop exposing themselves.” She told how Grandmamma raised many children in the community; how she taught what was and what was not allowed. Dr. Stewart then engaged the audience with a verse from the song “Grandma’s Hand”. Dr. Stewart took us back to 1860 and 1867, when African Americans began to experience glory. The 13th amendment abolished slavery and the slaves were able to leave the plantations. The 14th amendment made all persons born or naturalized in the United States citizens and of due process, equal protection and civil rights. The 15th amendment gave us the right to vote. Then things changed, white supremacy showed its ugly face. Brave men like A. Philip Randolph and others had to teach themselves to read protect. Before you knew it we had 50,000 join the NAACP, but the clan had grown to over 200,000. Dr. Stewart looked out into the audience and began to recite Langston Hughes “Life for me ain’t been no crystal stair.” She concluded her speech by telling the audience a story about Papa Dallas, her blind granddaddy. As a small child she would lead him around to get whatever he needed. He would sit on the porch and make predictions on what people would become as they would pass by. One day she became curious and asked him how was he blinded. Papa Dallas told her they whooped him, got a hot iron and burned his eyes. He asked her to get the Bible, which was one book he always wanted to read. He made her promise that she would read every book, go to school and tell all the children his story. Papa Dallas predicted she would become the spokesperson she is today. After a standing ovation, Carolyn Blackshear, President of the Martin Luther King, Jr. Observance Day Association, Inc. gave remarks before the audience was dismissed. To learn more get your copy of “Remembering Papa Dallas”, directed by Dr. Tonea Stewart.